Tonight I will be attending–at the kind invitation of our students–the Honor Society for Sustainability banquet. This is a great chance to celebrate accomplishments, including graduation, as well as induct new members into the society. 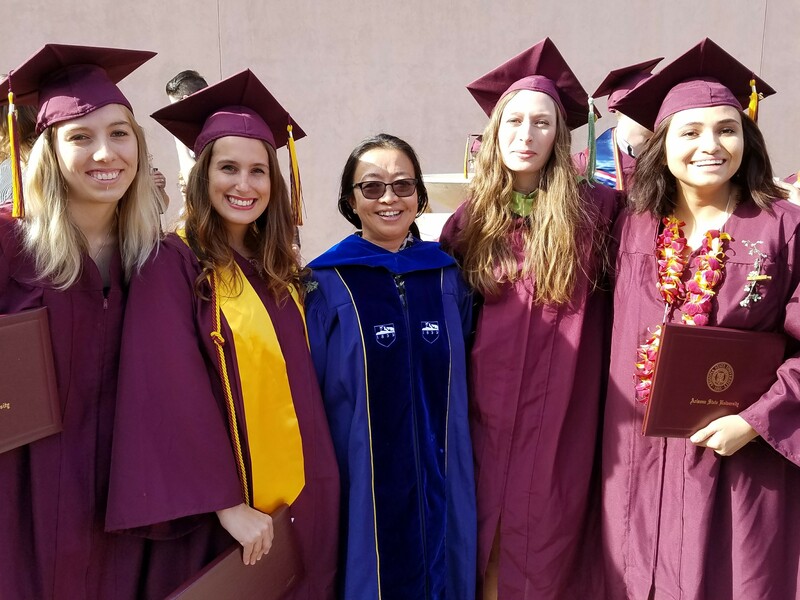 Similar to many other sustainability efforts, ASU was the first to create a national honor society specifically for sustainability. I am pleased The Honor Society for Sustainability is open to students at ASU in other sustainability programs besides our majors. In my book, sustainability is something to be shared, not hoarded. In the next year, my hope is that chapters will open at other universities around the country. To really make a difference in addressing sustainability challenges requires concerted collaboration and network building. I like the words “honor” and “sustainability” sharing the same space. Honor, as we know, can be a noun or a verb. As a noun, it is often used to describe something or someone held in high esteem. Sustainability deserves our highest esteem for the magnitude of challenges it takes on alongside the sense that we can create a better future. As a verb, honor can denote an action of holding something or someone in high esteem, like a great piece of art or a loved relative. To honor can also mean to fulfill an obligation or keep a promise. For the students graduating from ASU this year and to the new inductees, I would like them to think of the Honor Society for Sustainability in both meanings of the word honor. We have events like banquets to hold you in high esteem as excellent students. But you should also think of honoring the society and honoring the promises and obligations you must keep to ensure that its mission, and the mission of sustainability, remain with you no matter where you go. It is my great pleasure to be here to celebrate the 2nd graduating class of the EMSL. 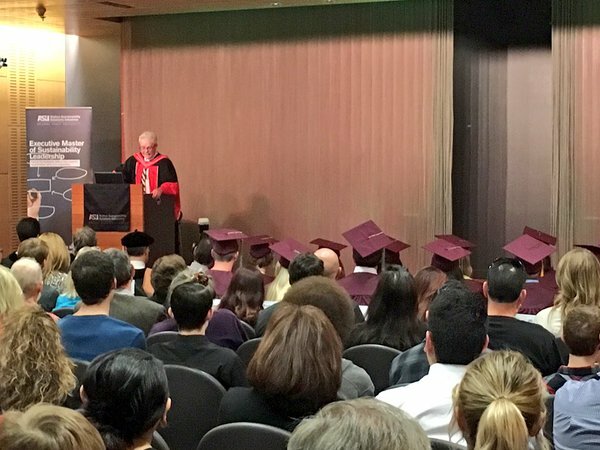 Many of you know that this degree was created in response to demand from working professionals, like yourselves, and from our partners in industry, government, and NGOs. The message was loud and clear – in the rapidly growing field of sustainability what was needed most urgently was leadership. Organizations then as now are looking for individuals who can formulate a clear vision, communicate it and share it effectively so that others will follow and support that vision, provide the resources and support to realize the vision, and find ways to balance conflicting priorities and interests of stakeholders in order to achieve goals. Leadership is hard. It’s even harder when you need to practice it in a new, unfamiliar field that spans and transcends multiple boundaries. You most likely will not be leading the production of widgets. You will be convincing sometimes entrenched stakeholders that an integrated systems approach to how organizations function, that puts into practice key sustainability principles, will add value, enrich the company’s vision and culture, energize employees and clients, and move the world closer to a more desirable future. This is an enormous challenge, but one that will surely get you out of the bed in the morning. I realize I am talking to a biased sample in this auditorium – you came here in the first place because you want to make a difference, a few simple words that are incredibly inspiring, without limits, but a goal that each of us can realize in our lifetimes. David Brooks, the op-ed contributor to the New York Times, reminds us to think about our “eulogy” virtues and not just our “resume” virtues. We spend a great deal of time and effort trying to fill out and strengthen our resumes with job experiences and accomplishments. This is important, but when people gather in a large room like this to celebrate the end of your life, ask yourself how you would want to be remembered, and let that guide the pathways you take, and make. From this kind of reflection on what is most important, we will all benefit – this generation, future generations, and the planetary systems that provide the basis for the beautiful and wondrous thing we call life. I urge you to make the most of the new lives you embark on today, for yourselves and for the people who will remember and thank you for the differences you make. “Be the change you want to see in the world”*, a message that adorns many t-shirts and bumper stickers, is an elegant summary of what drives and inspires students in the School of Sustainability. One of the first lessons our students learn is that sustainability is about hope and action. Understanding the nature of human and environmental problems is important, but sustainability trains students how to take action, generate solutions, and build a desirable future. No one can build a desirable future for the planet on their own, but individual actions and ideas can inspire others to follow, especially if the ideas are good and compelling. Several years ago, I heard a presentation by the eminent Sustainability scholar, Professor William Clark, on what is required to make good ideas like sustainability resonate with people and take hold. He argued that our ideas should be salient, credible, and legitimate. By salient, he means that the information or argument we create or use should be relevant for making a decision. Credible means that the information or argument meets the highest standards of scientific plausibility. Legitimate means that the process for gathering the information or making the recommendation is fair and unbiased, making sure that as many stakeholders as possible have an opportunity to voice their needs and wishes. What this means for you is that when you develop an idea for how to solve a problem or develop a solution to a sustainability concern, we can teach you how to make that idea salient, credible, and legitimate. The more you can do that, the more likely you will create a lasting impact in positive ways. Be the change you want to see in the world, and the world may follow. Ready to join the School of Sustainability? Click here to find out how. About 45 years ago, the Carnegie Foundation developed a classification system for defining the different missions of US universities. Arizona State University is in the top tier of research universities, classified as “very high research activity.” Of the nearly 3,000 degree-granting four-year colleges in the United States, ASU is among the 108 universities that have earned this highest research distinction. What does this mean for undergraduate students in the School of Sustainability? It means that you can have the best of a small college experience (we are the smallest college at ASU) with the research opportunities of a top performing research institution. Research is more than just acquiring knowledge (although that is important). It is about discovery. This can mean anything from working in a professor’s lab on new, innovative research to working with companies or organizations to find new ways to solve problems. For example, Dr. Childers supervises undergraduate SOS students for his research examining the ecological impacts of an artificial wetland, built by the City of Phoenix to treat wastewater at less energy and monetary costs than traditional systems. In Nepal, one of our students conducted research with Dr. Chhetri to examine the impacts of climate change on farmers’ livelihoods. And as I mentioned in my post on internships, all of our students have the chance to put their research skills to practice in order to solve sustainability challenges for a wide variety of organizations. Research is one of the defining qualities of a university. The ability to conduct research, to discover what others do not see, is an incredibly valuable and much sought after skill. Through your coursework, internships, workshops, and other opportunities, you will hone your research skills in the School of Sustainability. ASU and the School of Sustainability offer ample opportunities to help you build those skills — I encourage you to make the most of it! And remember that we are here to help. When the school opened its doors in 2007, we decided to make a special investment in a dedicated internship coordinator. Since sustainability was a very young field, we wanted to be sure that our students had the opportunity to show how they could add value to workplaces. We also recognized then, as now, that internships are important for building resumes and professional skills, and for giving our students a chance to try out what they learned in the classroom in the “real” world. You will find that the internship is a very rich and worthwhile experience and a really important part of your education. The School of Sustainability will be with you every step of the way to make sure it is a meaningful educational opportunity. The internship program in the School of Sustainability has been a shining success. We now have more internships than students, a product of our excellent staff members who work tirelessly to identify the best possible opportunities for you. The first thing they do is match your interests to the internship. You will meet with the internship coordinator, talk about your studies and career goals, and then build a portfolio of opportunities. While you are pursuing your internship, you will enroll in a class offered by the internship coordinator. This is a skills building class that allows you to translate what you learn immediately to the internship experience. You will learn how to problem solve, work effectively in the workplace, and improve your professional communication skills. The highlight and culminating experience is a poster session where you and other students will summarize what you did and what you learned. Internship providers, as well as faculty and staff, come to the poster session. This is a great chance for you to reflect on your accomplishments and to meet and greet other potential employers. The poster session is very fun and informative and you will walk away with another product for your portfolio. And remember, you can always do more than one internship! Want to know more about how we will help you will find an internship? Have a look at this “Getting Started” guide. Here are a couple of stories about internships students like you have benefitted from. If you have any questions about the program, please take a look at our internship page and feel free to contact us. The one thing we have heard from alumni is that it’s never too early to start planning for an internship. One of the five core competencies we teach our students is collaboration (the other four, if you want to start studying, are systems thinking, future thinking, values thinking, and strategic thinking). The essence of this idea is that to understand or solve complex sustainability challenges, you need to be able to collaborate. No single person has the capacity or capability to tackle the really fundamental challenges we face. You will have to rely on others and actually learn the skill of collaborating. Effective collaboration depends on a lot of factors, but building a sense of community and shared purpose is one key ingredient. The School of Sustainability is a wonderful incubator for building community, and for many of you it will start in the residences. The School of Sustainability Residential Community (SOSRC) is where many of you will begin building the collaborative networks that will help you succeed in classes, in university life, and in life after college. The SOSRC is located in Adelphi II, which recently underwent some renovations guided by sustainability principles developed with students (see photo above). This is a nurturing and supportive environment where you will learn how to work together to get things done. You will be surrounded by students from the same major who, like you, are looking for an education inside and outside the classroom that focuses on solutions. It is a wonderful community where you will quickly develop a sense of belonging. The School of Sustainability provides a full-time staff member to be a resource for you in the residential community. This person helps you arrange special events (including dinners and lunches with the dean), pinpoint resources for projects (such as the SIRF I wrote about last week), organize outings on and around campus, design and deliver field trips, and in general make sure you get the most out of your experience in the SOSRC. In previous posts I have written about the advantages of building community in a small college in a large research-intensive university. The SOSRC, as a small residential community within a small college, is a great way for you to develop that sense of belonging that we cherish in the School of Sustainability. Residential life is a beginning point in your development as a sustainability student, a great way to start learning the importance of collaboration to meet with confidence the challenges ahead of us. Have a look at our residential life page and see how it can help you become part of the SOS team. I look forward to having dinner with you there this fall!